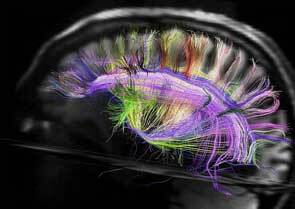 Harvard scientists have developed hi-tech new methods to explore inside the human brain using magnetic resonance scanning. 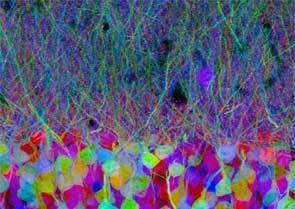 Professor Jan Wedeen claims that the rainbow-coloured scans offer the first real insight into the pathways of the human brain's 100 billion cells - and how it works. 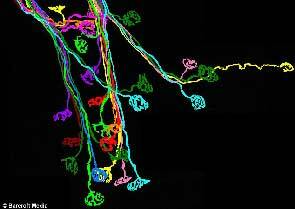 Professor Jeff Lichtman, also from Harvard, has developed a related technique used for tracing the connecting pathways between each neuron on animal brains. 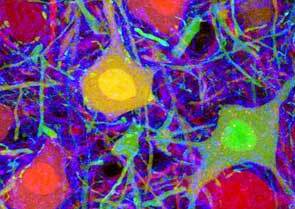 Using just three colours he is able to tag nerve cells with a certain colour before tracing the connections - a task that would take hundred thousand years using traditional methods. 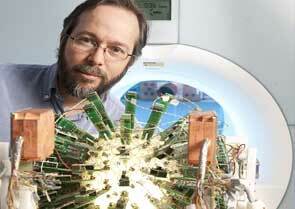 Lichtman said, 'The human brain is the most complicated object in the known universe. It holds our memories and our fears, processes information and allows us to see, hear and feel. 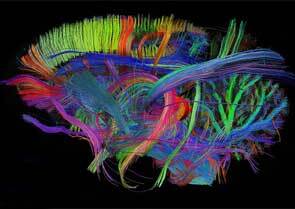 These pathways can then be used by scientists to create a 3-D map of the intricate networks that make up our brain. 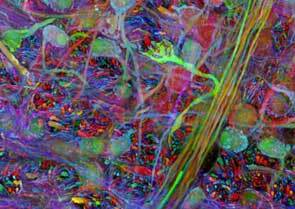 For a long time it was thought that the brain was a mass of tangled wires, but researchers recently found that its fibers are actually set up like a chess board, crossing at right-angles. 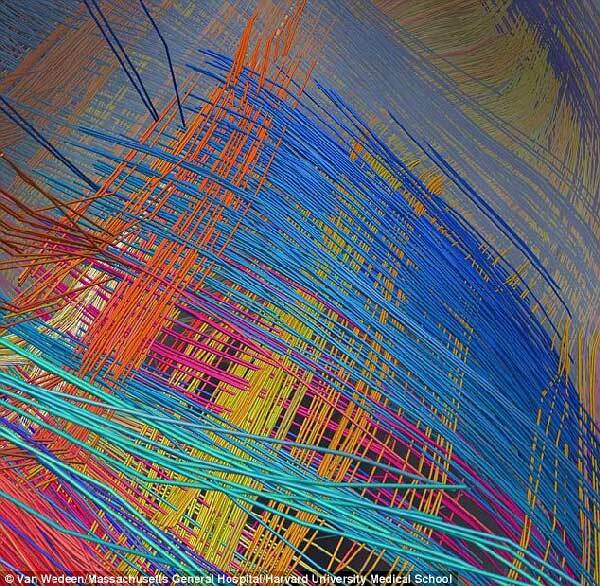 What’s more, this grid structure has now been revealed in amazing detail as part of a brain imaging study by a new state-of-the-art magnetic resonance imaging (MRI) scanner. 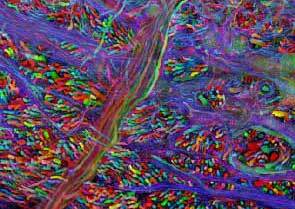 Van Wedeen, of Massachusetts General Hospital (MGH), who led study, said: ‘Far from being just a tangle of wires, the brain's connections turn out to be more like ribbon cables - folding 2D sheets of parallel neuronal fibers that cross paths at right angles, like the warp and weft of a fabric. Thomas R Insel, the director of the National Institute for Mental Health, said: ‘Getting a high-resolution wiring diagram of our brains is a landmark in human neuroanatomy. 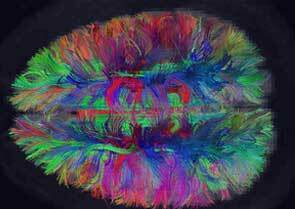 The Connectom MRI scanner was installed at MGH last year and can visualise the networks of criss-crossing fibers – by which different parts of the brain communicate with each other – in 10-fold higher detail than conventional scanners, according to Wedeen. 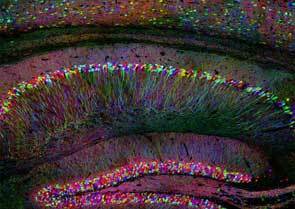 As the brain gets wired up in early development, its connections form along perpendicular pathways, running horizontally, vertically and transversely. This grid structure appears to guide connectivity like lane markers on a highway, which would limit options for growing nerve fibers to change direction during development. If they can turn in just four directions: left, right, up or down, this may enforce a more efficient, orderly way for the fibers to find their proper connections – and for the structure to adapt through evolution, suggest the researchers. Obtaining detailed images of these pathways in human brain has long eluded researchers, in part, because the human cortex, or outer mantle, develops many folds, nooks and crannies that obscure the structure of its connections. Although studies using chemical tracers in neural tracts of animal brains yielded hints of a grid structure, such invasive techniques could not be used in humans. It’s thought that with previous technology 25 per cent of the brain’s structure was revealed – the new scanner shows 75 per cent of it. Results of the study appear in the journal Science.